Indexes with two or more levels are called multilevel indexes. The idea behind a multilevel index is to reduce search time required for searching the whole data file. A multilevel index considers the index file which will be referred to as the first level of a multilevel index, as an ordered file with a distinct value for each k(i). Hence we can create a primary index for the first level; this index to the first level is called the second level of multilevel index. Because the second level is a primary index, we can use block anchors so that the second level has one entry for each block of the first level. The main disadvantage of the index-sequential file organization is that performance degrades as the file grows. A B+-tree index takes the form of a balanced tree in which every path from the root of the tree to a leaf of the tree is of the same length. In a B- tree every value of the search field appears once at some level in the tree, along with a data pointer [may be in internal nodes also]. In a B+-tree, data pointers [address of a particular search value] are stored only at the leaf nodes of the tree; hence, the structure of leaf nodes differs from the structure of internal nodes. The leaf nodes have an entry for every value of the search field, along with a data pointer to the record. 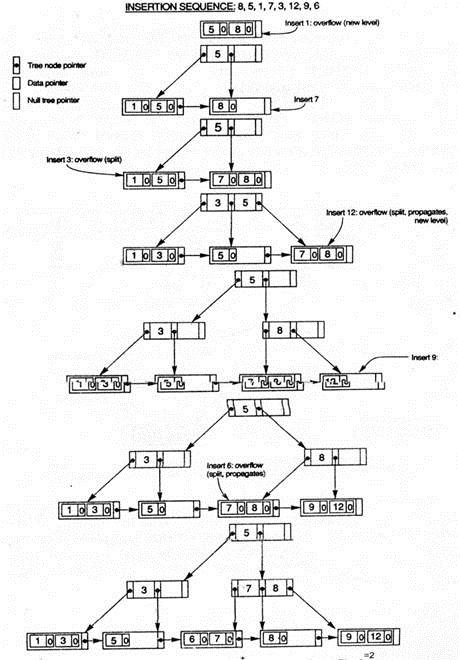 A B+ tree is a multilevel index, but it has got different a structure. 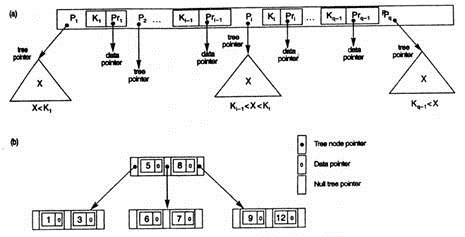 A typical node of the B+ tree contains upto n-1 search key values such as k1,k2…….n-1 and n pointers p1,p2…..pn. The search key values within a node are kept in sorted order, ki < kj. The number of pointers in a node is called the fan out of the node. Ø The structure of a non-leaf node is the same as leaf nodes, except that all pointers are pointers to tree nodes. Ø The root node has at least 2 tree pointers. Ø All leaf nodes are at the same level. Consider an example, assume that we wish to insert a record in a B+ tree of order n=3 and pleaf=2, first we observe that root is the only node in the tree, so it is also a leaf node. As soon as more than one level is created, the tree is divided into internal nodes and leaf nodes. Notice that every value must exist at the leaf level, because all the data pointers are at the leaf level. However, only some values exist in internal nodes to guide the search. Notice also that every value appearing in an internal node also appears in the sub tree as the rightmost value. Say for example, to insert 12, the node is split into two nodes. The figure shows the two leaf nodes that result from inserting 12. An existing node contains 7 and 8 and remaining value 12 in a new node. The first J = [((Pleaf + 1)1/2)] = 3/2 = 2 entries in the original node are kept there and the remaining entries are moved to a new leaf node. The J th search value is replicated in the parent internal node, and an extra pointer to the new node is created in the parent. If the parent internal node is full, it must be split. This splitting can propagate all the way up to create a new root node. B – Tree indexes and similar to B+ tree indexes. 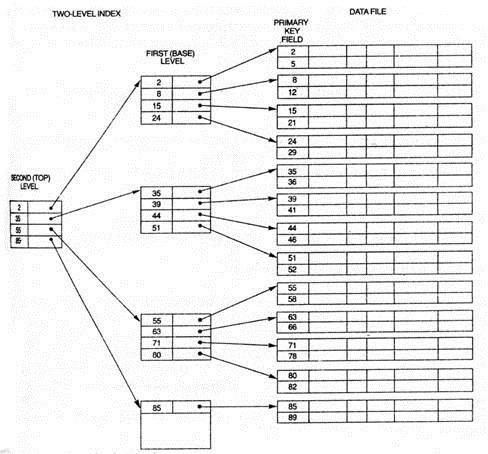 The main difference is that a B tree eliminates the duplicate storage of search – key values. In the B+ tree every search key value appears in some leaf nodes and several are repeated in non-leaf nodes. AB – tree allows search – key values to appear only once, hence B – tree requires fewer nodes. However, since the search-keys appear only once, in a B – tree, every node contains search value along with an address of that value [pointer point either to file records or to buckets that contain the search value]. Consider figure B, in the values 5, 8, 1, 3, 6, 7, 9, 12 are values of the indexed filed. Consider the top node, which consists of two value entries [5 and 8] and three pointers. Values less than 5 or equal to 5 are placed in the left lower node, similarly values greater than 5 and less than 8 are placed in the middle node, and greater than 8 are placed in the right lower node. A B – tree starts with a single root node [which is also a leaf node] at level 0 [zero]. Once the root node is full with p – 1 search key values, we attempt to insert another entry in the tree, the root node splits into two nodes at level 1. Only the middle value is kept in the root node, and the rest of the values are split evenly between the other two nodes. When a non root node is full and a new entry is inserted into it, that node is split into two nodes at the same level, and the middle entry is moved to the parent node along with two pointers to the split nodes. If the parent node is full, it is also split. Splitting can propagate all the way to the root node. B tree eliminates the redundant storage of search key values. Deletion in a B tree is more complicated. In a B+ tree, the deleted entry always appears in a leaf. In a B tree, the deleted entry may appear in a non-leaf node.